Whether you're a Loudoun local or a frequent winery visitor, the Visit Loudoun Wine Passport opens the door to winery experiences all over Loudoun County. 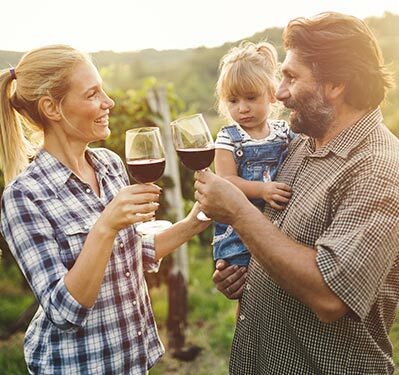 Sip on a glass of vino with family or friends while you enjoy all that Loudoun's Wine Trail has to offer from boutique style wineries where you can see the winemaker walking through the vines to Napa-Style tasting rooms that will take your breath away. This passport will be instantly delivered via text message or email and can be used immediately! 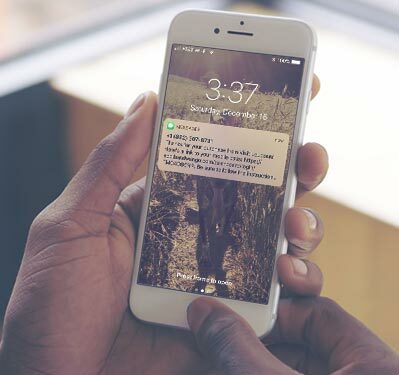 You'll never have to worry about downloading an app because the pass will be accessible on your phone wherever you go. 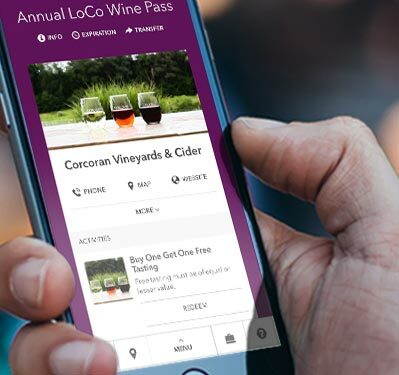 The LoCo Wine Pass is a curated collection of great deals and offers from Loudoun county's best wineries and vineyards. When visiting a winery or vineyard, simply present your phone to redeem your tastings, discounts and special offers. 50 West is a farm vineyard located on Route 50 just past the historic town of Aldie in Middleburg, Virginia. Our tasting room and vineyards sit high on a bluff offering stunning views of the Bull Run Mountain range. We are located in a civil war battle area and are just minutes from the historic town of Middleburg and the rolling horse farms of Virginia. We make both red and white wines produced in the classic Bordeaux style of France. 8 Chains North is a small family-owned and -operated farm winery located in Waterford, Virginia. We produce Old-World-style handcrafted wines, poured by a friendly and knowledgeable staff. We believe that the best wines begin in the vineyard, and invite you to enjoy a glass or bottle with us. Three families in pursuit of a shared passion have come together to create 868 Estate Vineyards on the Loudoun County Wine Trail.The adventure began when Peter Deliso, Wendy Charron and Carl DiManno, all with a strong interest in amazing wine and hospitality experiences, decided to take the bold step to open a premier vineyard and winery. Bluemont Vineyard is a country farm winery located 951 feet above elevation at the top of the Blue Ridge Mountains overlooking the Loudoun Valley. From the vines that cling to the sun-kissed mountainside, to the orchards that spread out below, it is our terroir that makes our wines unique among Virginia Wineries. Bogati Winery, inspired by the cultures and wines of Argentina, has produced award-winning wines since 2010. The tasting room is located in the old Hill High Orchard building on Rt. 7, just ten minutes outside of historic downtown Leesburg. Cana Vineyards is a family-owned winery. The property was a beautiful Middleburg hay farm when we first discovered it while out for a leisurely drive in 2009. In January 2011, we purchased the 43 acre parcel of land, nestled between the historic towns of Aldie and Middleburg and offering a view of the western slopes of the Bull Run Mountains. The Leesburg Vintner was established in 1988 and is known for providing a wide selection of wines from around the world; great wines that fit every budget. The Vintner has a reputation of stocking delicious varieties at reasonable prices and has won many awards including the Loudoun County Chamber of Commerce Small Retailer Business of the Year as well as the Virginia Wine Retailer of the Year. Owners Lori and Jim Corcoran bought 120 acres and established a farm with cattle, sheep, goats, and chickens, and Lori planted a large garden. In 2001, they found themselves amidst a booming wine region and decided to plant grapes. Lori took winemaking classes and Jim transferred his research and development expertise from the high tech industry to winery operations. And as they say, the rest is history. The Winery, which hosts a tasting room of rustic elegance, a bridal loft and barrel room is an Amish structure. It is crafted with the best hardwoods and, in the tradition of raised barns, has a feel from years gone by. Natural materials were used throughout the building including local stone, black walnut from the property and handcrafted metal work. A field stone fireplace provides a warm and cozy atmosphere on cool nights or on lazy winter days. Attached to the winery is an iconic silo that mimics the interior of a wine barrel complete with metal strapped oak. Doukénie Winery is a family run winery located in Loudoun County, DC’s Wine Country where guests feel the warmth and hospitality of the Bazaco family from the moment they enter the tasting room. The Bazacos trace their success back to Doukénie Babayanie Bacos, who at 14 years old boarded a boat for the journey to America. Hidden Brook Winery is located in a log cabin surrounded by a peaceful forest, far away from the hustle of everyday life. Our custom log cabin was built in 2000 by the hands of the owners Eric and Deborah Hauck, with the help of family and friends. This charming winery was founded in May 2008 by, husband and wife, Clyde and Terry Housel. The couple, who came from long careers with the Federal Government, began planting their vineyard in 2001 and were grape-growers first. The Housel’s decided from the beginning they would focus on producing grapes, and then wines, of superior quality. Clyde, who is the winemaker and largely self-taught, is doing just that. Hiddencroft wines are approachable and readily drinkable. The Baki family bought the property in 2001 with the hopes of creating a vineyard and winery with the help of their son, Kerem, who at the time was studying Enology in the Graduate program at Virginia Tech. The family began their dream by planting each vine by hand in 2003 and started serving their first wines out of tasting room that same year. Bora’s other son Tolga, assisted in the business development and marketing of the vineyard while ‘Momma Baki’, Zeynep, established the beautiful aesthetics you see today in the tasting room and gardens. A great glass of wine starts right here in the vineyard. They say it’s easy to make a good wine from good grapes. It’s even easier to make a bad wine from good grapes. A top-notch winemaker can make a great wine from good grapes. However, it is impossible to make a great wine from bad grapes. The Barns at Hamilton Station Vineyards is a family owned and operated winery housed on a refurbished dairy farm. The winery is located just off of Route 7 in the quaint, historic town of Hamilton, Virginia only ten minutes from historic Leesburg. Beginning with carefully selected Virginia grapes, winemaker Michael Shaps creates wines inspired in the Bordeaux French style, but are uniquely expressive of Virginia. Take 10% off bottled wines. Just minutes from Leesburg, the Wine Reserve at Waterford is a convenient escape for a truly unique tasting experience. Enjoy sweeping views of the Blue Ridge and Catoctin Mountains paired with carefully crafted wines, local food, and friendly staff. You waive and release Bandwango, Visit Loudoun and its subsidiaries, affiliates, partners, officers, directors, employees and agents from any Liabilities arising from or related to any act or omission of a Merchant in connection with your use of a Voucher or the goods, services or experiences a Merchant provides in connection with the Voucher (“Activity”). I agree to indemnify and hold harmless Bandwango, Visit Loudoun, and its subsidiaries, affiliates, partners, officers, directors, employees, and agents against any and all liabilities brought by you or anyone on your behalf, including attorney fees, and any related costs, if litigation arising pursuant to any claims made by you or by anyone else acting on your behalf. You acknowledge that Bandwango and Visit Loudoun and their directors, officers, volunteers, representatives and agents are not responsible for errors, omissions, acts or failures to act of any party or entity conducting a specific event or activity in connection with the Activity. The Merchant is the sole issuer of the Voucher. Vouchers are not redeemable for cash. Unauthorized or unlawful reproduction, resale, modification or trade of Vouchers is prohibited. Pricing relating to certain Merchant offerings and Products on the site may change at any time in Bandwango and Visit Loudoun's discretion, without notice. YOU ACKNOWLEDGE THAT YOU HAVE CAREFULLY READ THIS “TERMS AND CONDITIONS” AND FULLY UNDERSTAND IT INCLUDES A RELEASE OF LIABILITY. YOU EXPRESSLY AGREE TO RELEASE AND DISCHARGE BANDWANGO AND GO CEDAR RAPIDS AND ALL OF ITS AFFILIATES, MANAGERS, MEMBERS, AGENTS, ATTORNEYS, STAFF, VOLUNTEERS, HEIRS, OR REPRESENTATIVES, PREDECESSORS, SUCCESSORS AND ASSIGNS FROM ANY AND ALL CLAIMS OR CAUSES OF ACTION AND YOU AGREE TO VOLUNTARILY GIVE UP OR WAIVE ANY RIGHT THAT YOU OTHERWISE HAVE TO BRING A LEGAL ACTION AGAINST BANDWANGO OR GO CEDAR RAPIDS FOR PERSONAL INJURY OR PROPERTY DAMAGE.